Before beef on weck and chicken wings became staples of the city's restaurants, there was beef tongue and woodcock. 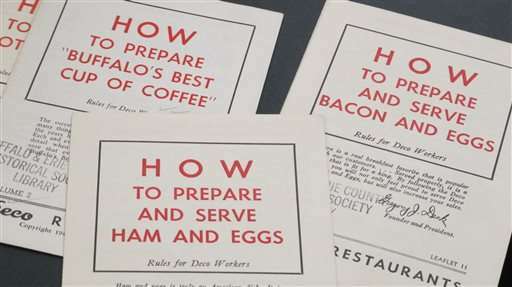 An array of restaurant menus amassed by the Buffalo History Museum offers a taste of the city's culinary story—from yesterday's mock turtle soup and creme de menthe cocktails to today's mesclun greens and fried calamari. Menu collectors here and elsewhere say there's no more fascinating way to dish about the past. "Tastes change all the time," said museum library director Cynthia Van Ness. "What you think is wonderful and exciting today is going to seem pedestrian and stodgy tomorrow." Van Ness so far has assembled about 5,000 Buffalo menus, some dating to the 19th century, and has put out a call for more. "A lot of institutions and libraries have collections," said Rebecca Federman, a librarian at the New York Public Library, which boasts a 45,000-menu collection, "and based on the number of emails I get from regular people who want to donate the menus, it seems like a lot of people collect them as well." Auction site eBay is full of vintage bills of fare, with sellers asking anything from under a dollar to $30 or more. The New York Public Library is digitizing the rest of its menu collection to appeal to the variety of people who browse through it: the foodies and chefs looking for historical inspiration, relatives of departed restaurateurs longing for a glimpse of family history. "We've had historians from Germany and from France who have been discovering the wine lists and traced the rise of German wines in the United States," Federman said. A marine biologist once used the menus to study how the fish being served at the time corresponded to the species' populations in neighboring waters. The Buffalo collection marks the appearance of oysters after the 1825 opening of the Erie Canal, which shortened shipping time. Menus from the 1970s began highlighting vegetarian-friendly dishes like the "completely meatless" marinara sauce at one former restaurant. The city's signature chicken wings didn't come along until 1964. The local favorite beef on weck—roast beef on a salty kummelweck roll—is believed to have appeared during the 1901 Pan-American Exposition. While perusing a mid-19th century menu that featured mangoes as an ingredient, Van Ness was surprised the tropical fruit was available in 1848 Buffalo. "Maybe our ancestors were more adventurous with food than we think they were," she said. "There are things we look at now and go, 'ew.' I don't think many people are interested in beef tongue these days." The design of the menus followed typography and printing trends of the times, like lithography. A late 19th century menu from department store J.N. 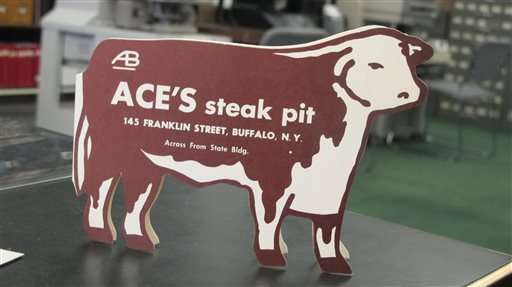 Adam & Co. has a colorful lithograph of a woman winding up to throw a ball, while a 1960s-era steakhouse menu (when a steak was $2.75) was cut in the shape of a cow. Harvest gold and orange of the 1970s adorn some menus from that period. A 1940s menu from former nightclub Little Harlem features a selection of Chinese food for 65 cents, Welsh rarebit and golden buck for 75 cents and a 40-cent creme de menthe drink. It also informs of a dancing tax of $2.50 per person that the club was required to collect under a 1924 law. "Part of why I love them so much is because of how transportive they are," said food blogger Adam Roberts, who decorated his kitchen walls with vintage menus from flea markets and garage sales. "One look," he said, "and you're whisked back to a very specific moment in time, revealing everything from the tastes of the era—aspic anyone?—to how much people paid to eat well." Low-calorie restaurant menus: Are they making us fat?